The Palestinian Health Ministry in Gaza has reported that a teenage boy died, on Saturday morning, from serious wounds he suffered by Israeli army fire on Friday. 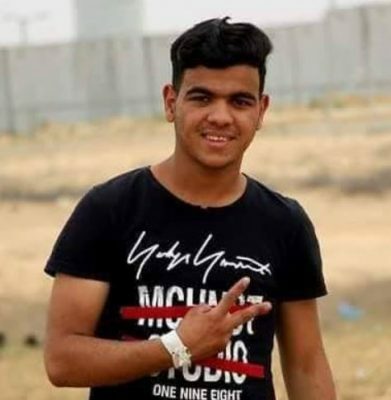 The Health Ministry identified the slain teen as Mo’men Fathi al-Hams, 17, and said that he suffered very serious wounds a day earlier, during the Great Return March processions in the coastal region. The teen, from Rafah, in the southern part of the coastal region, was shot with a live Israeli army round in the upper chest, east of Rafah, and remained in a critical condition until he succumbed to his wounds. On the same day of his critical injury, the soldiers killed two Palestinians, including one child, and wounded 246 others, among them eleven who suffered serious wounds, 10 women, 4 medics, one journalist and 19 children. The Health Ministry said an Israeli army sharpshooter shot Majdi Ramzi Kamal Satri, 12, with a live round in the head, east of Rafah city, and added that the second Palestinian, Ghazi Mohammad Abu Mustafa, 45, was also shot with a live round in the head, east of Khan Younis, also in the southern part of the Gaza Strip. Their deaths bring the number of Palestinians, killed by Israeli army fire since March 30th, 2018, the Palestinian Land Day, to 155, including 19 children, two medics and two journalists. The soldiers also injured 355 medics, and caused damage to 58 ambulances, during the same time-frame. The Health Ministry demanded holding Israel accountable for its serious violations against the medical teams, and the civilian population, and to act on providing them with the urgently-needed protection.